How do I opt out an employee? How do I refund contributions if an employee has opted-out? Eligible jobholders may choose to opt out after they have been automatically enrolled. Non-eligible jobholders who have opted in may choose to opt out after they have been enrolled. Workers who have been enrolled under contractual enrolment (e.g. under their contract of employment) and entitled workers who have asked to join a scheme do not have the right to choose to opt out. If they want to leave the scheme, they must cease membership in accordance with the scheme rules. The easiest way to opt out an enrolled employee is from the Pension Dashboard. To access the Pension Dashboard from "Setup/ Options" > "4 – Practice Pension Details". 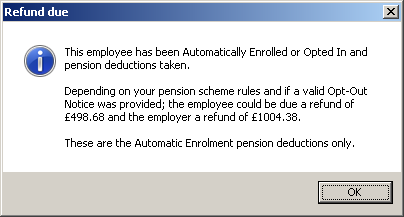 Click "Auto Enrolment Details" then "Pension Dashboard". Click on the employee you want to opt out and then click "Opt-out"
Complete the Opt-out date and reference. The reference should be given to you by the employee, they would receive this from the pension provider when they inform them of their intention to opt out. Click "OK". The employee has been opted out and no further pension contribution will be processed. 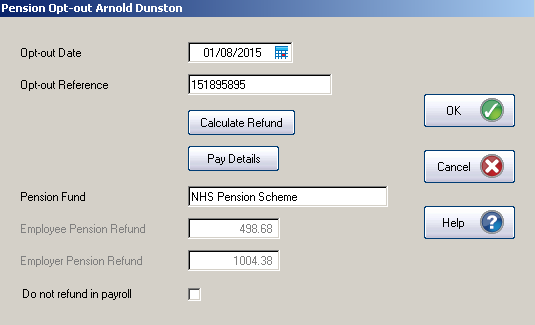 The value of the refund calculated will be processed in your next payroll calculation. The opt out reference would normally be given to the employee when they inform the pension provider of their intention to opt out. Pension refunds CANNOT be included in the pension contribution files. When the pension contribution file is produced the refund will not be shown. When processing the FPS the negative value will be submitted which will “contra” off the previous pension contributions. Customers will need to speak with their pension provider to finalise the refund records at the providers' end. You can only process a maximum refund equal to the current YTD pension values for the employee. If you are refunding for contributions in a previous tax year these would be processed as any other normal payment to the employee. An EYU would then be required to correct the pension values for the previous year.